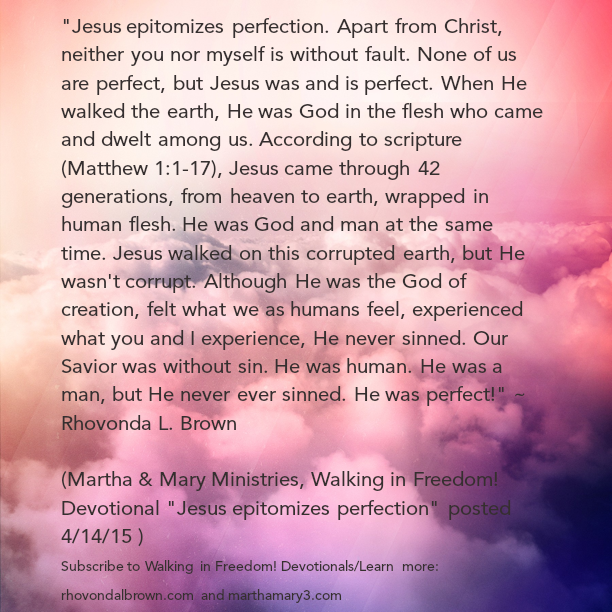 Jesus Epitomizes Perfection – Walking in Freedom! The email listed 30 characteristics of a woman whose heart is like Christ. Here are the words that were listed: approachable, available, compassionate, confident, courageous, disciplined, faithful, focused, forgiving, generous, gentle, good, gracious, humble, joyful, kind, loving, patient, peaceful, prayerful, pure, responsible, sensitive, a servant, submission, thankful, truthful, virtuous, wise, and worshipful. I admit, when I looked over that list, I asked the question, Is there truly a woman like this? Upon reading those 30 words, all I could think of is perfection, excellence, flawless! Jesus epitomizes perfection. Apart from Christ, neither you nor myself is without fault. None of us are perfect, but Jesus was and is perfect. When He walked the earth, He was God in the flesh who came and dwelt among us. According to scripture (Matthew 1:1-17), Jesus came through 42 generations, from heaven to earth, wrapped in human flesh. He was God and man at the same time. Jesus walked on this corrupted earth, but He wasn’t corrupt. Although He was the God of creation, felt what we as humans feel, experienced what you and I experience, He never sinned. Our Savior was without sin. He was human. He was a man, but He never ever sinned. He was perfect! While Jesus walked this earth, He was as approachable, available and compassionateto all who came to Him and to those He passed by. He was confident in who He was, the Son of God, sent to save the lost. He was courageous and fearless. He went places that others were too afraid to go and did things others would not want to do. For example, He traveled through the region of Samaria and spent time with a Samaritan woman and the Samaritan people, even though the Jews had no dealings with Samaritans (John 4). Jesus said things that others were too afraid to say. He spoke out boldly against the religious leaders. He said and did what the Heavenly Father instructed Him to do. He was disciplined, faithful, and focused on His assignment. He stayed the course. He didn’t waiver, but followed God’s plan. He didn’t alter the mission, but completed it! Jesus had His eyes and mind set on the cross, committed to His Father’s assignment. Here is our self-check for today√ : What characteristics am I displaying? Am I showing those around me Christ-like characteristics? Am I approachable? Does my attitude draw others to me or does my attitude keep people away? Do I make myself available for others who are in need? Am I compassionate and discerning for those who are hurting? 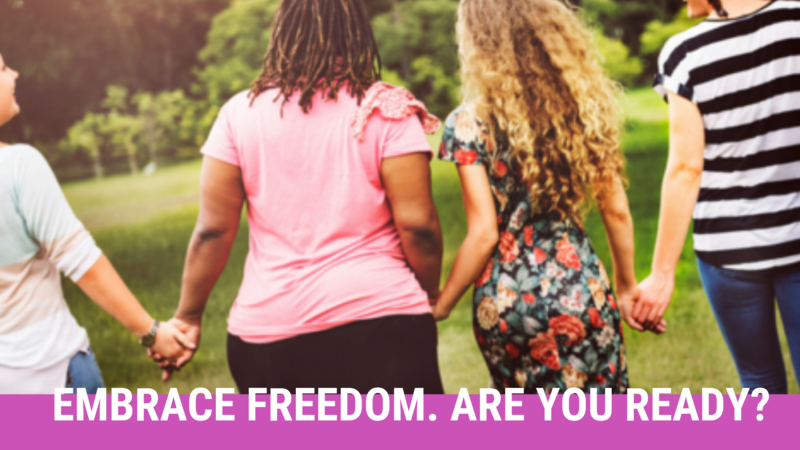 Do I have confidence in who I am in Christ? Am I bold when it comes to standing up for God? Am I courageous enough to go beyond the four walls of my church, in order to share Christ with the world? Am I determined and motivated to keep my mind set on completing the assignment God has given me? Everyday, the Lord gives us opportunities to point someone to Christ. With that huge responsibility, how will we take advantage of that awesome opportunity to share Jesus with someone today? Let’s not let that moment slip by us. Someone is in dire need to hear that they are loved by the Creator of the universe. During your Quiet Time, ask the Lord to show you how you can be more like Christ.